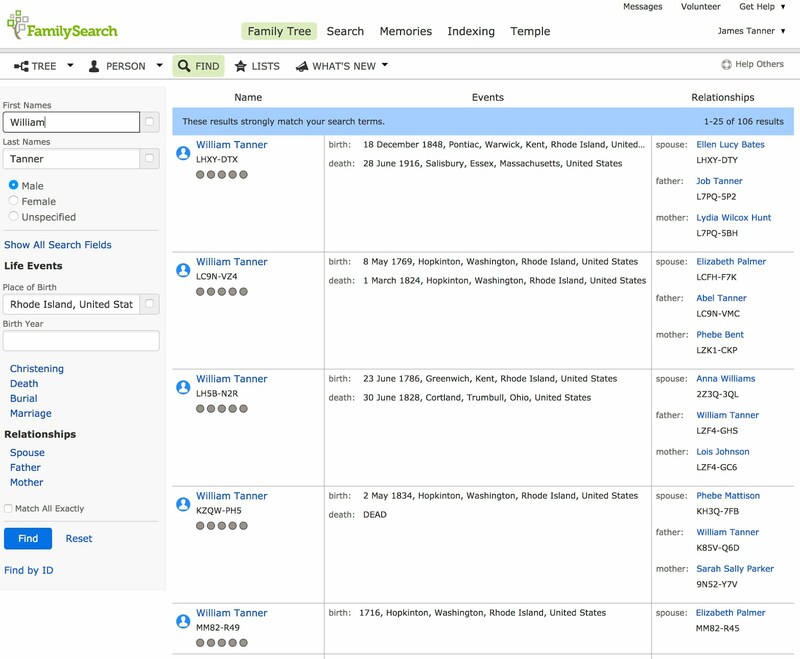 FamilySearch Support (Toll Free: 1-866-406-1830). 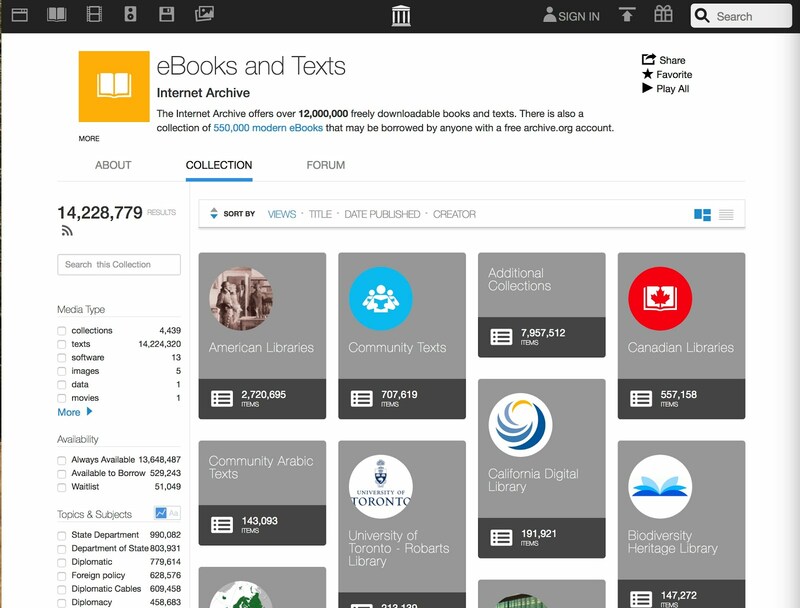 Salt Lake City, Utah (30 August 2017), Thursday, September 7, 2017, marks the closing of an 80-year era of historic records access to usher in a new, digital model. 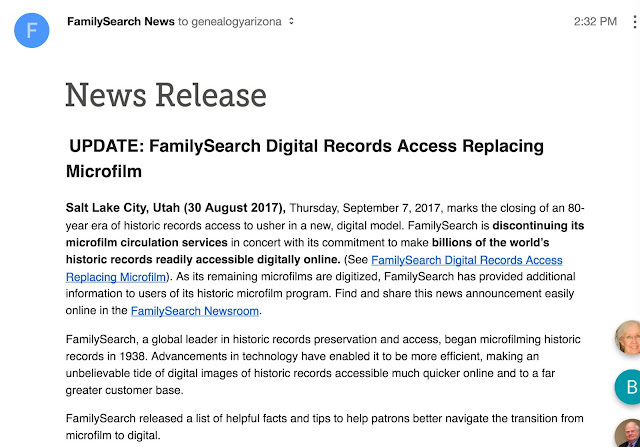 FamilySearch is discontinuing its microfilm circulation services in concert with its commitment to make billions of the world’s historic records readily accessible digitally online. (See FamilySearch Digital Records Access Replacing Microfilm). As its remaining microfilms are digitized, FamilySearch has provided additional information to users of its historic microfilm program. Find and share this news announcement easily online in the FamilySearch Newsroom. My own comments in tomorrow's post. 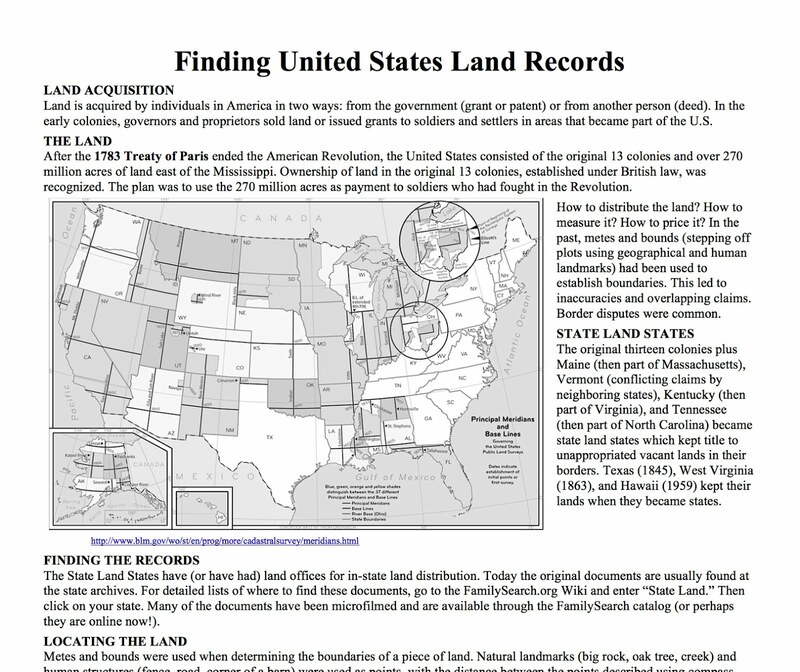 I found an excellent summary of how to find U.S. land records from the Santa Clara County Historical and Genealogical Society in Santa Clara, California. The Society also has a valuable list of indexes to local Santa Clara County records. 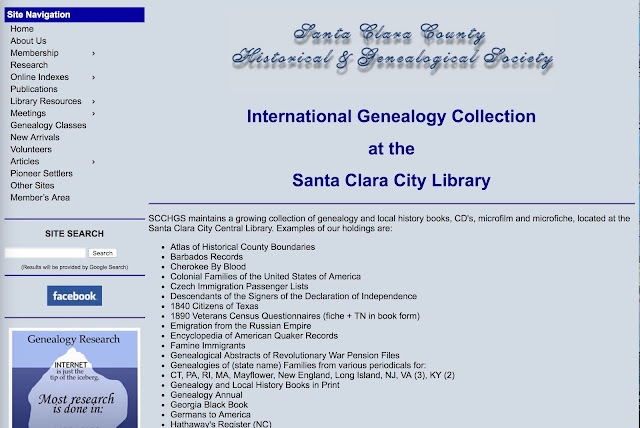 This website is an excellent example of the type of information available from local historical and genealogical societies. 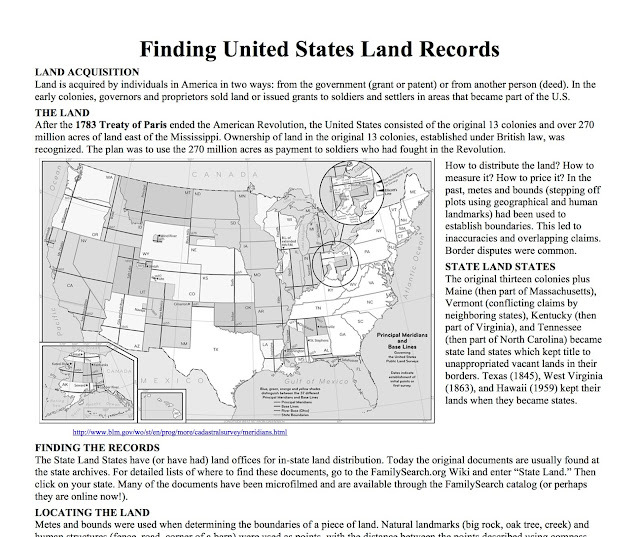 I found this particular website while investigating federal land records on the Bureau of Land Management website and land records on Ancestry.com. I have often needed a map of the principal meridians and baselines and found one on the BLM.gov website. Also, don't forget to search and local libraries and museums. There are some other interesting facts illustrated by this list. 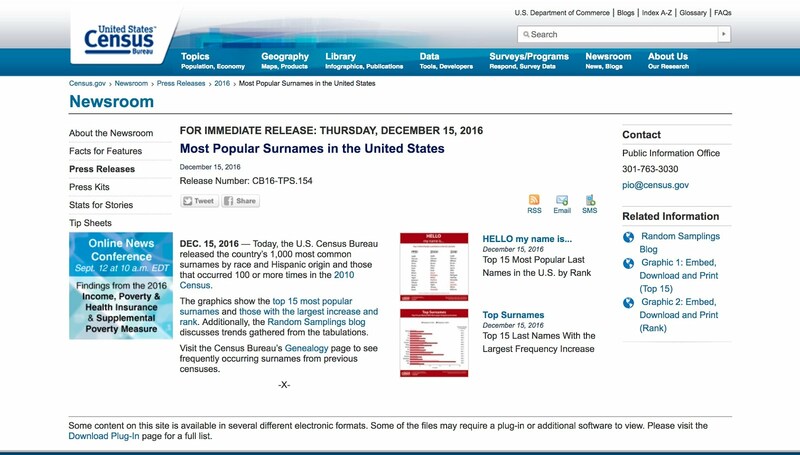 in 1990 there were no Hispanic sunames in the top 15. Today, there are six. But it also likely that the top three will not be displaced for a long time. The Archives Library Information Center (ALIC) is more than a traditional library. 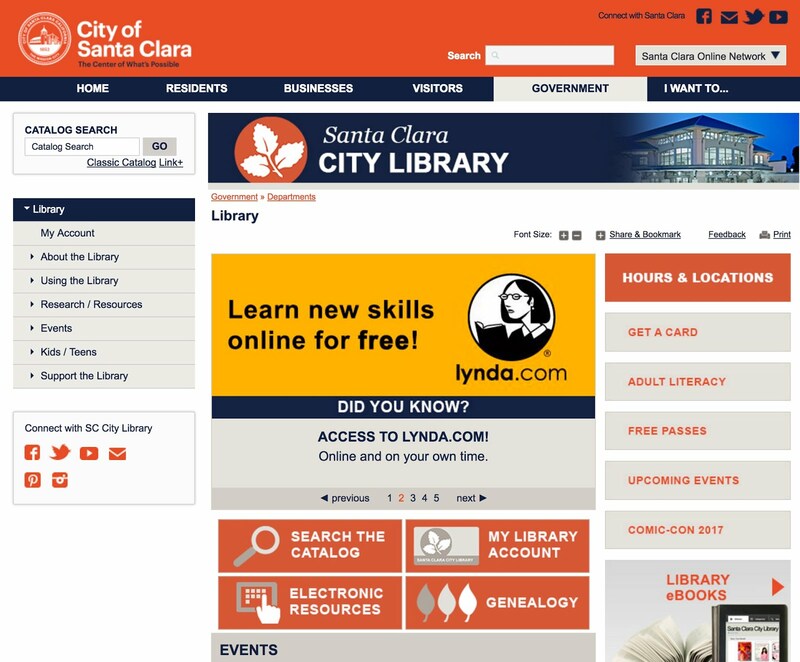 Recognizing that our customers no longer expect to work within the walls of a library, these pages are designed to provide NARA staff and researchers nationwide with convenient access to content beyond the physical holdings of our two traditional libraries. 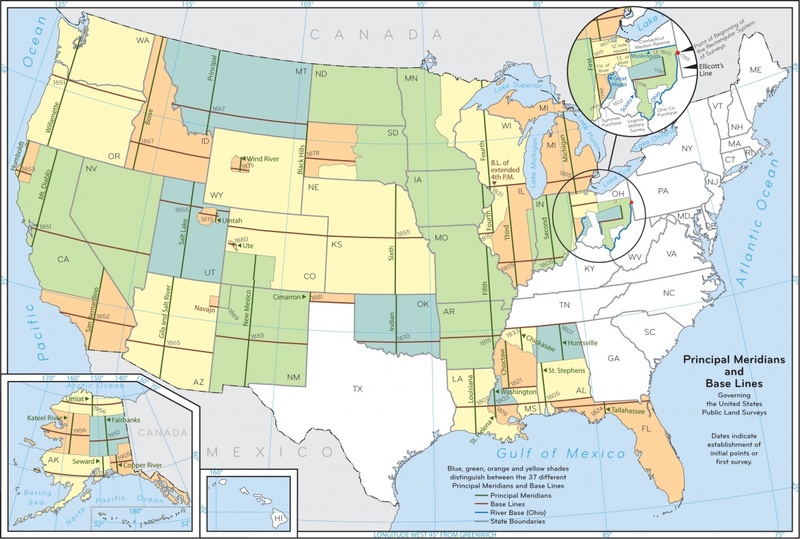 ALIC provides access to information on American history and government, archival administration, information management, and government documents to NARA staff, archives and records management professionals, and the general public. 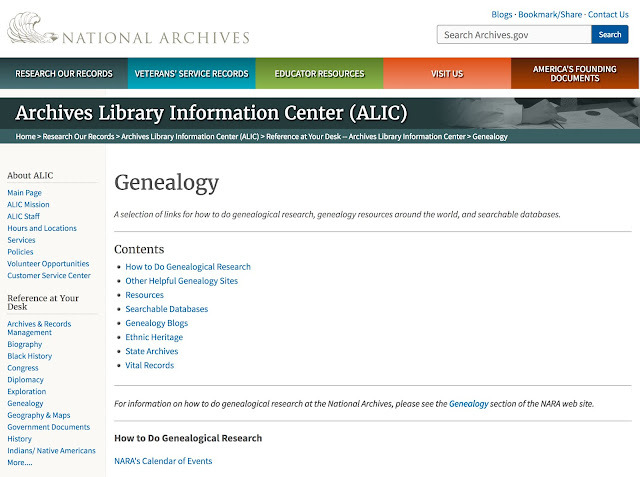 As part of these services, the ALIC has a useful reference page dedicated to genealogy. This webpage provides many valuable links for both the beginning and advanced genealogical researcher. 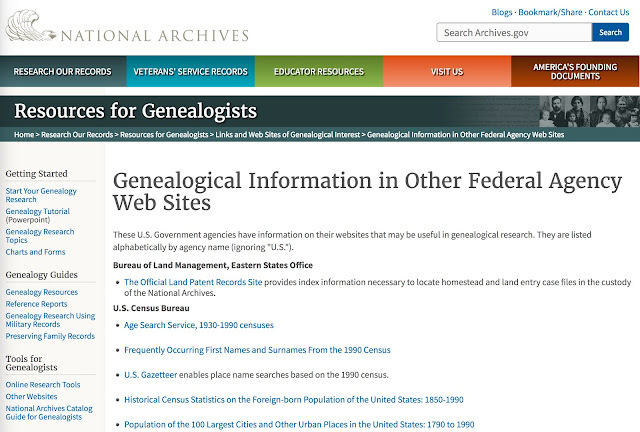 For example, one of the linked pages includes genealogical information on other federal agency websites. Some of the links on the website reminded me of places on the Internet I have not visited for some considerable time. I also found that several of the links were outdated and no longer active. The links to some of the blogs also reinforced my impression that genealogical blogging was in a serious decline but with some active highlights. 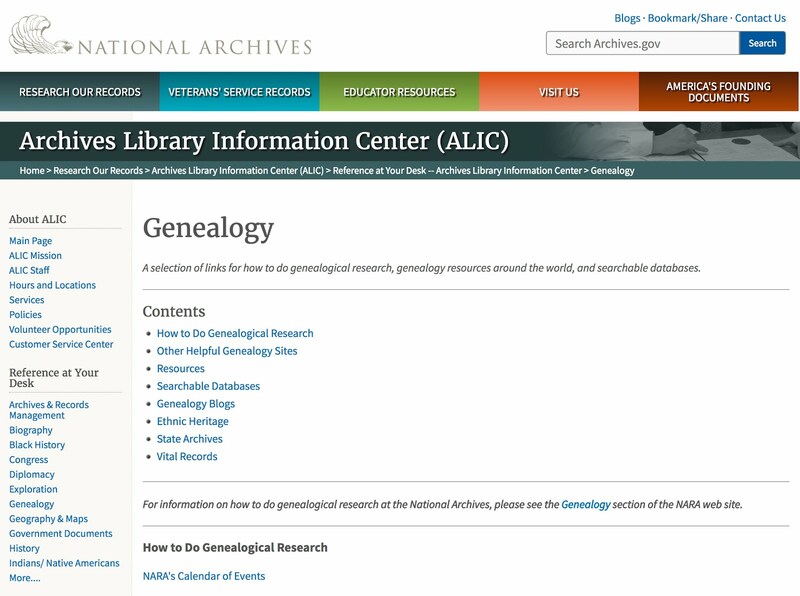 I am certain that many of the resources linked from this page are going to be new and unexplored by nearly all genealogists. The reason for this conclusion is that I see almost no references to these resources in any of the genealogically oriented conferences or other educational materials. As of September 30, 2014 all member log-in functionality and the following pages were retired and are no longer accessible: MyAccount, MyGenealogy, My Home Pages, HeritageQuest (ProQuest) content; Virtual Cemetery; Outdated and less popular help articles; and Shop. 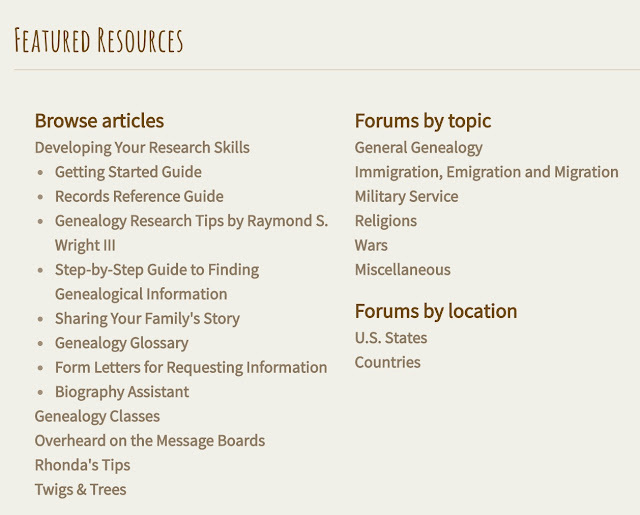 GenForum message boards, Family Tree Maker homepages, and the most popular articles remain available in a read-only format on Genealogy.com, meaning the pages are preserved to allow you to view, but not edit information. The website is essentially a snapshot in time. 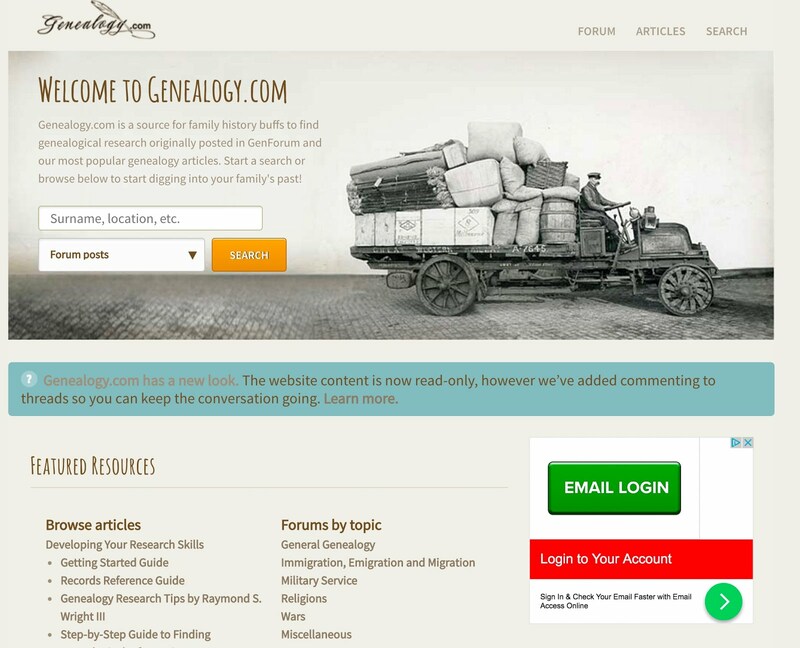 Originally, it was an active forum for discussion of genealogical research. However, when the website was frozen, the discussions were preserved as of the date the website was revised. For example, there is a screenshot showing the forum discussions about the Tanner surname. If you look closely, you can see that the latest dates are in 2014. The website is still a good resource for research topics but is no longer an active participant in the genealogical community. Here is a screenshot of the overall topics on the website. 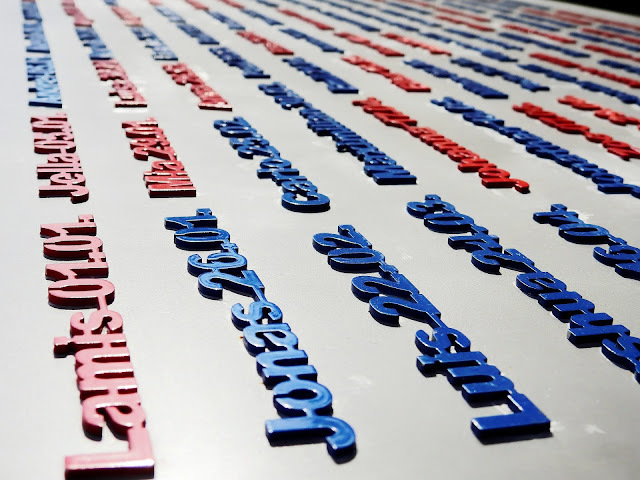 Online forums were at one time the descendants of the pre-Internet bulletin boards. 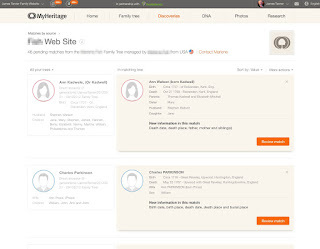 Nearly all of the online genealogy forums have been superseded by social networking programs. 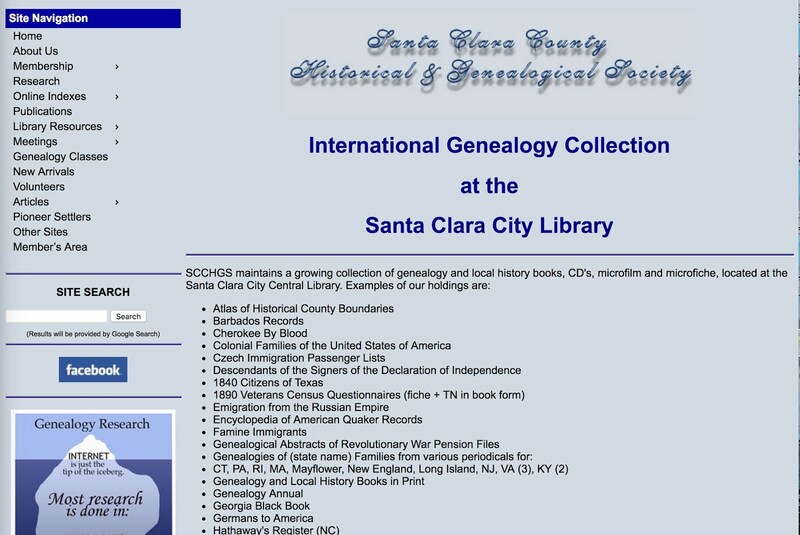 Some of the functions of the forms on Genealogy.com are still available on RootsWeb.com, also owned by Ancestry.com. Note: Please read the comments to this post to get an idea of the extent of the problem outlined. This series is a summary of the research into the origins of the Tanner family of Rhode Island. It is the culmination of many years of research and in past posts, I have discussed the progress of the research several times in past posts and some of the information is cumulative. There are 106 "William Tanners" listed in the FamilySearch.org Family Tree that were born in Rhode Island. One of them, as shown by this screenshot, was born in 1608. What is the basic problem with this entry? Well, the data doesn't make any sense, but the real problem is the historical context. The history of Rhode Island is well known and readily available. The list of the earliest European settlers is also readily available. The most famous person on that list is Roger Williams. The earliest settlement date is the spring of 1636. On the 20th of April, 1636, 25 people crossed the river from Seekonk, in the Plymouth Colony, to a location on the Moshassuck River in Narragansett territory which Williams named Providence Plantation. 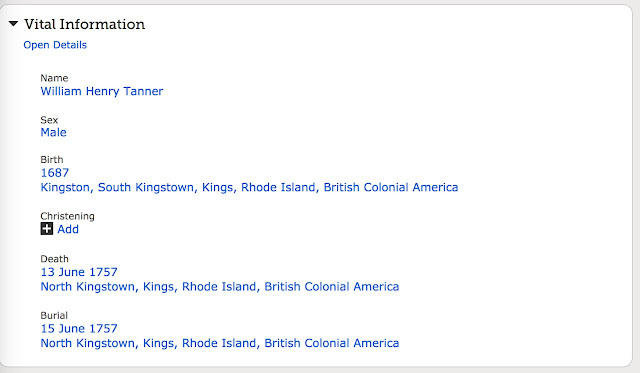 See Wikipedia: List of early settlers of Rhode Island. 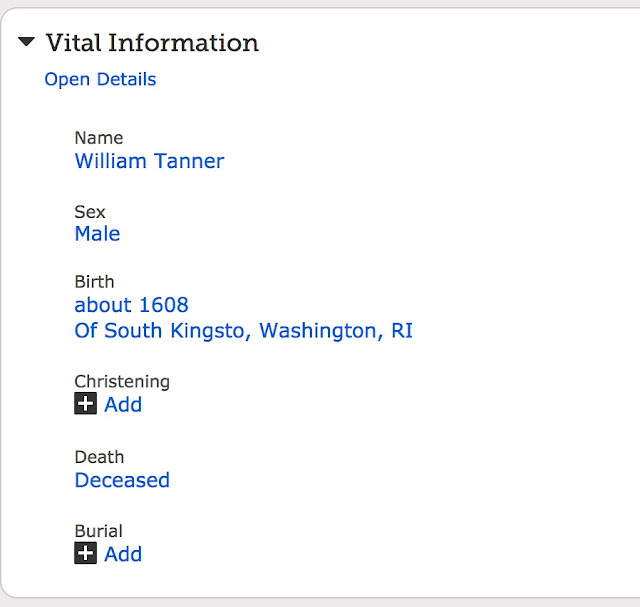 Of course, the entry above says that William Tanner was "of South Kingsto (? ), RI" but does that make sense? South Kingstown, Rhode Island was formed in 1722. See Wikipedia: South Kingstown, Rhode Island. This William Tanner who have had to be over 114 years old to have lived in South Kingstown. How do these kinds of errors originate? Here is another example from the list of 106 William Tanners. Once again, this William Tanner was born 35 years before South Kingstown, Rhode Island was established. 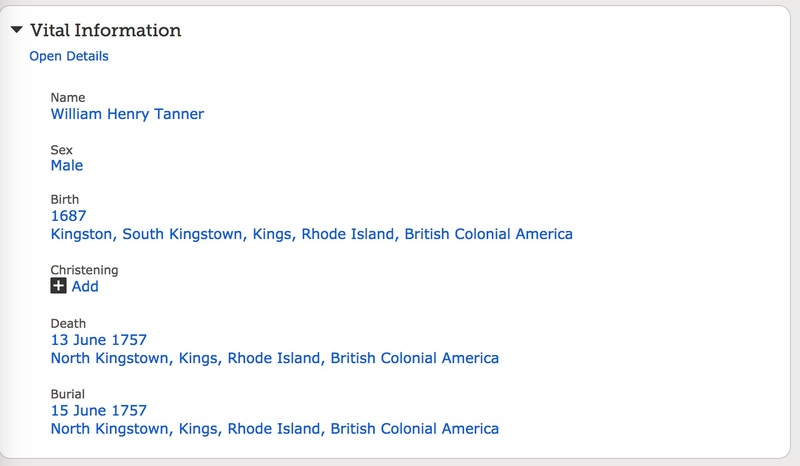 Interestingly, after years of research, I have yet to find a record showing a middle name for the William Tanners that lived in Rhode Island in the 1600s and 1700s. The most persistent and prevalent error passed down in the Tanner family is the assumption that there was only one William Tanner in Rhode Island during the late 1600s and early 1700s. Obviously, there were not 106, but some of those on the list fall outside of the time period. The actual number of people with that name is still subject to research, but it is more than three and probably more than five. If I limit the search in FamilySearch.org to the number of William Tanners who were born around 1680, then I get seven results. 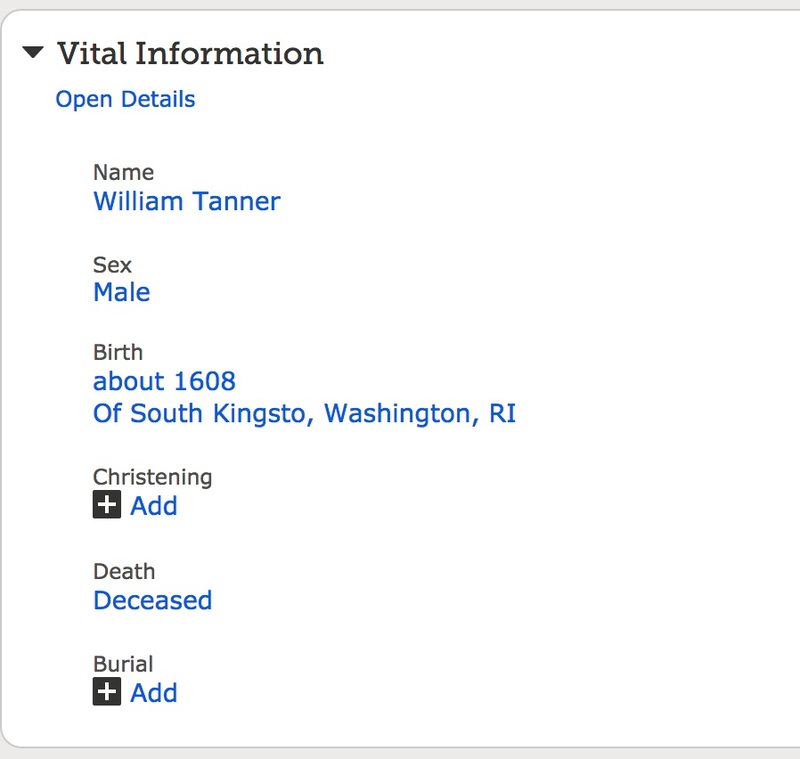 But there are now 2493 additional possible entries with names similar to William Tanner. 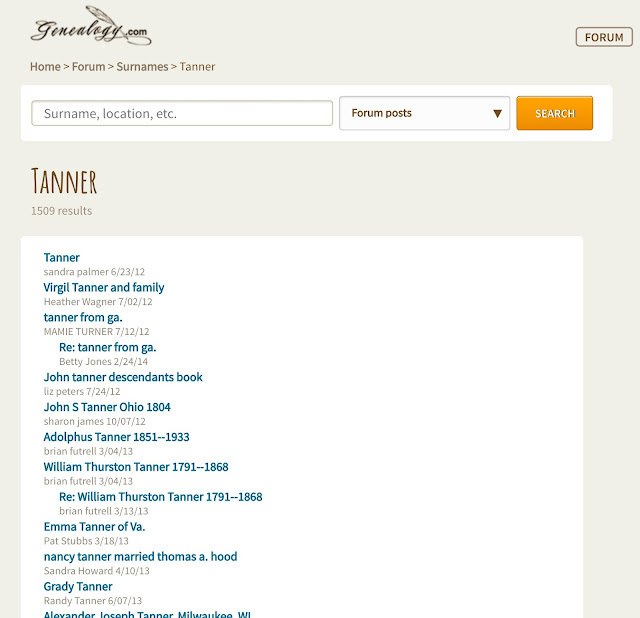 Approaching the problem from the assumption that the records containing a reference to a William Tanner all refer to the same person or ignoring the historical realities has created this massive log-jam of names in the Family Tree. It is also important to mention that almost none of that list of William Tanners has even one source attached. It is evident, that a massive cleanup effort will have to be undertaken in order to establish some baseline for identifying the correct ancestral lines. I really have no idea at this point as to what to do with these extra, unsupported and wrong entries in the Family Tree. 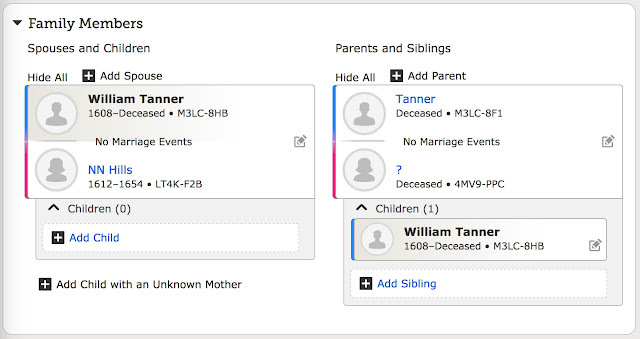 My ultimate goal is to whittle them down until I identify Francis Tanner's parents, the last Tanner in my line that is adequately supported by documentary evidence. I will have to think about a solution for a while. 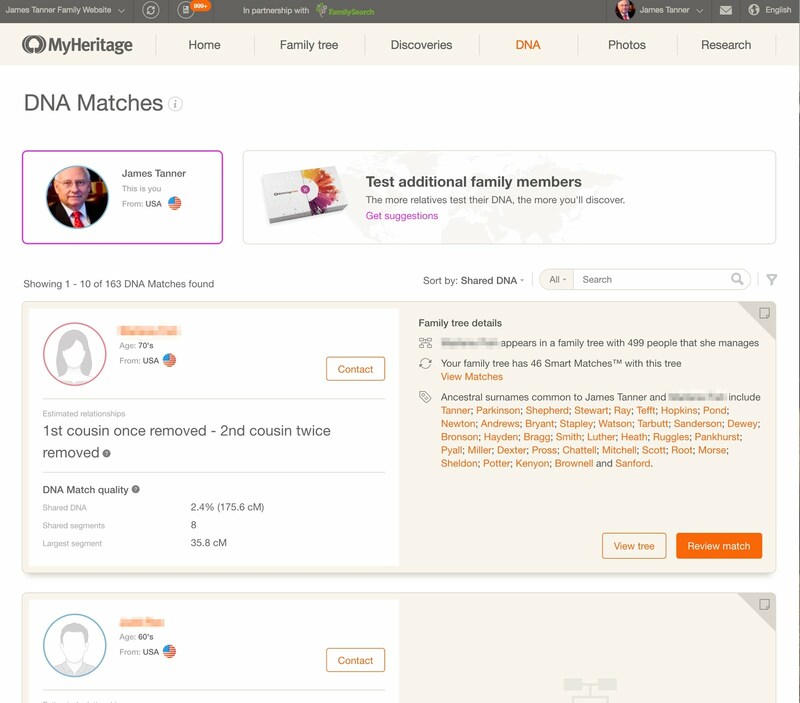 MyHeritage.com has introduced an expanded DNA Match Review. If you have a MyHeritage DNA test or have uploaded one from another source, you should be able to see the new features. 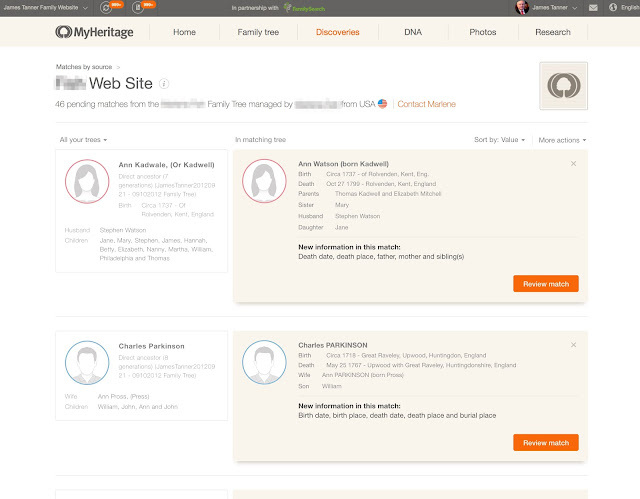 However, many of the features are not available unless your "match" also has a family tree on the website. One interesting feature shows you which of the "SmartMatches" you have correspond to your DNA matches. This information is useful if you are trying to establish a relationship with a possible remote ancestor. 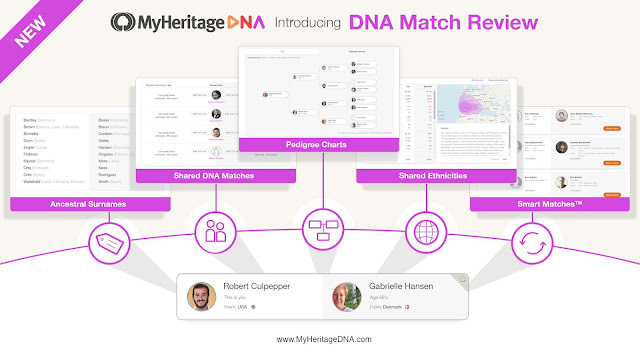 The problem is that you may have both identified the wrong ancestor, but that would become apparent with additional matches and documentation. I guess I am stuck on surnames for a while. One of the major challenges of genealogical research is the relative with a very common name. Unique names, especially unique surnames are quite rare since in most of the world's cultures some form of the name of a parent is often passed on down to a child. 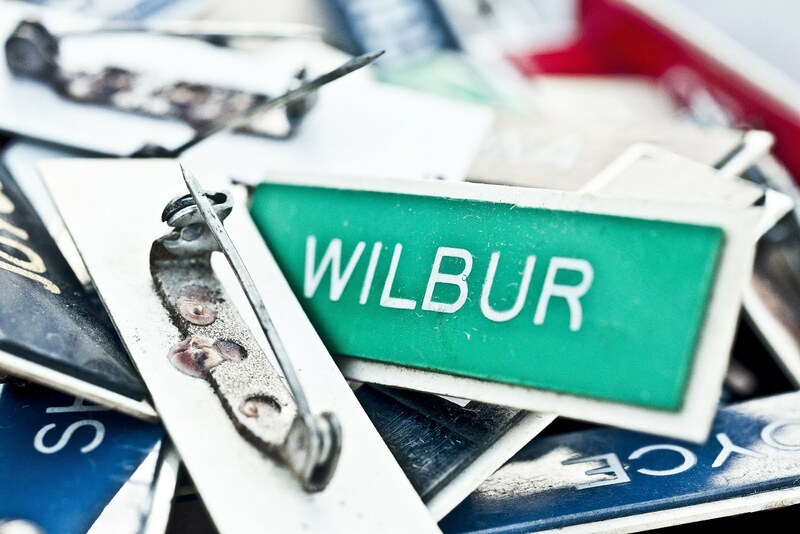 Let's explore the issue of the common or uncommon surnames with some hypothetical searches. Let's suppose that your ancestral line has a name such as "Smith." Most English speaking people would recognize that Smith is a very common name. But where is it common and how common is it and why, as a genealogist, would I like to know this information? Let's extend our hypothetical some more. Suppose you are searching for an ancestor named George Smith. What are the chances that you will find other unrelated people in the same area where your ancestor lived with that exact name? I you know the answer to that question, you then know how difficult it will be to separate out those people and you also know that your chances of choosing the wrong person are either high or low. Now it is time for an example search. In this hypothetical situation, I am going to suppose that my "George Smith" ancestor came from England and that he was supposedly born in the county of Kent in 1880. OK, so what do I do next? I use Findmypast.com to make the following searches. I have just confirmed by previous supposition that Smith is very common name. 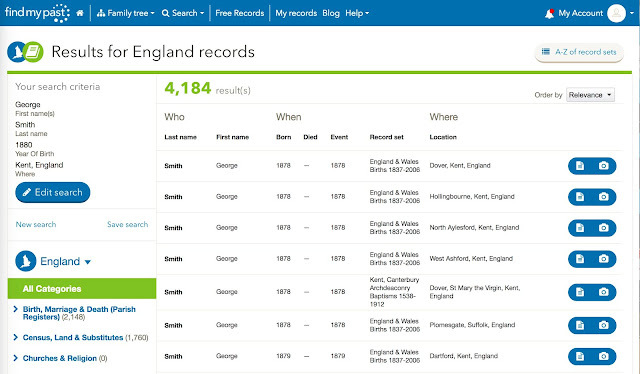 But how many Smiths are there in Kent born about 1880 in Kent? I will now edit my search to see. The number drops considerably but is still unworkable. What about adding the given name George? Now we are getting an idea of the challenge of finding our particular George Smith. I have a one in 4,184 of guessing which George Smith is mine if all I know is his name, his birth year and the county in England where he was born. But what I constantly see in online family trees is exactly that. I see people identified with a name, a generally vague date and a non-specific place. What does this show? It shows that these guesses about the identity of their person are much more likely wrong than they are correct. Here is a real example from the FamilySearch.org Family Tree. OK, here the date is 1715. The place is a little more specific but there are no sources. So, this person is not real. He is a guess. How accurate is that guess? Let's do the exercise from the hypothetical. First, how many people in England at all times have the Tarbutt surname? I won't show all the screens this time, but the number is relatively small if I search for all the name variants: 176,091. Now what if I put in a date and a county? The number drops to 103 a significant improvement in the odds that I have the right person. Now what if I add the name George? Here are the results. What? There are no results? What does this mean? 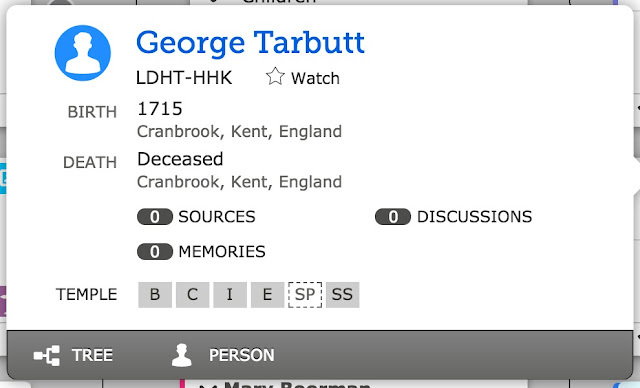 It means that in all the records on Findmypast.com, they do not have one George Tarbutt (with variations) that lived in Kent in 1715. So what are my chances of finding him? Almost exactly zero. Why? 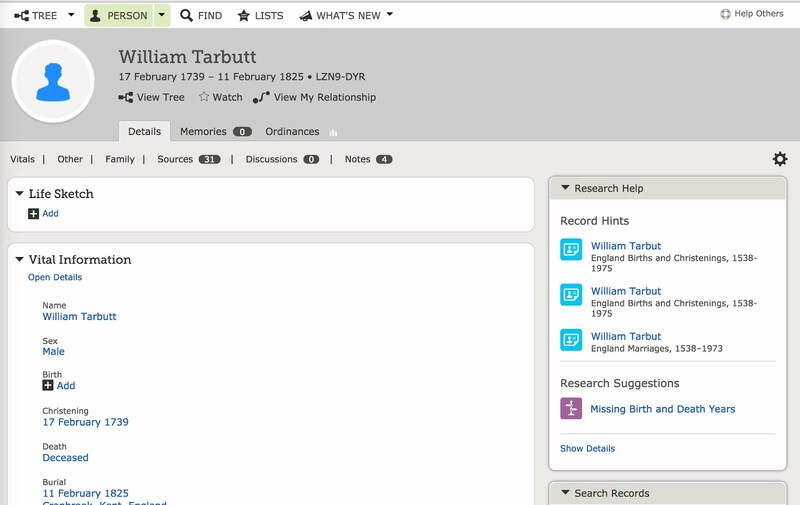 Now, if I look at his son, William Tarbutt, I see that he has extensive documentation in form of 31 sources with three record hints waiting to be entered. All is not lost, we may still find George Tarbutt. But we now know that we have to do some real research in real records and not simply rely on an unsupported entry in the Family Tree for an identity. Time to get to work. Our surname search has lead us to the methodology we should use to determine the accuracy of our work. I made a reference to voice recognition software in a recent post about using the Bluetooth interface that came with my hearing aids to dictate text to my computer. I decided to expand on that topic and write about the current status of voice recognition software in general. Not too long ago, my wife discovered that she could dictate text messages on her phone. As a result, the number of her text messages has increased exponentially. She has also found a tendency to insert commas and periods into conversations in other contexts. We have also been frequently amused by the misinterpretation of her speech by the voice recognition program built into her phone. About once a year, I write a post focusing on the issue of the status voice recognition software. Despite the development of sophisticated voice recognition programs by Apple, Google and Microsoft, there is still a paucity of programs available for purchase. There are some very expensive, high-end programs for specialized applications such as medical transcriptions. My view of the program set a somewhat skewed by virtue of the fact that I am using exclusively Apple computers. By the way, this entire post is being dictated using Dragon Dictate (Dragon Naturally Speaking for Windows) voice recognition software. Because of this fact, you might see some strange words and sentence constructions. I tried to go back through and edit the text but my editing isn't always complete. The need for careful editing usually cancels out any input speed gains. Any sudden increase in background noise or if someone in the room suddenly starts talking results in a garbled dictation. So why continue to try to use voice recognition software? The answer is a little bit complex. I did find out a number of years ago that the Dragon Dictate program that finally gotten to the point where it produced more clean text than errors. Since that time, computers have increased in speed and the program has continued to improve. Unfortunately, the price is also increased. The reason for this is rather simple there are no other competitive products. If I really wanted to use all of the features of the Dragon Dictate program, I could probably eliminate nearly all of my keyboard interaction with the computer. However, because there are limitations on the internal dictionary of the program and because of transcription errors, it is still necessary to occasionally use the keyboard to make corrections or add in words that the program simply cannot understand. 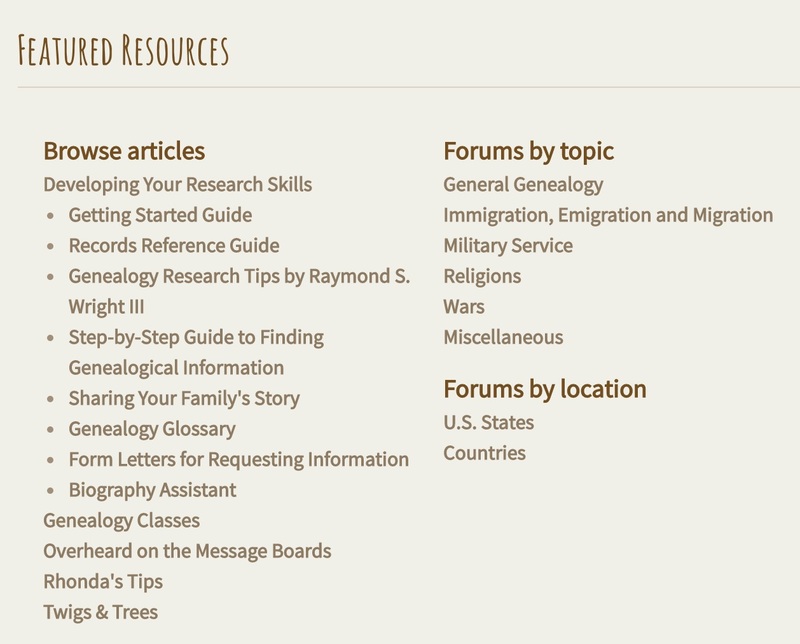 As I noted briefly in my previous post, none of the programs seem to accommodate research or data entry, especially for genealogical research. I have yet to find a program that I would use to fill in a family tree entry for example. All in all, the program works very well if you enunciate each word separately and distinctly. With a good microphone hooked up to a fast computer, you can dictate as fast as you can speak. But if you speak too quickly, the program will have a tendency to misinterpret some of the words more frequently. If your typing skills are limited, I would certainly suggest that voice recognition software could be a viable alternative. I would suggest starting with the built in programs available on both Apple OS X and Microsoft Windows operating systems. If you decide you can use voice recognition, you will still have to decide if your usage would justify the cost of a dedicated program. Computers have become ubiquitous. Demographically, genealogists generally fall into the "senior" category. On May 17, 2017, the Pew Research Center published a study entitled,"Tech adoption climbs among older adults." Of course, as time passes, those who are defined as "seniors" continues to change. What were then known as "personal computers" were introduced back in the 1970s. Therefore some of us who are considered to be "seniors" adopted computers going on 50 years ago. However, the Pew Research Center study cited above clearly shows a correlation between computer usage and age. Another recent Pew Research Center report indicates that 77% of all Americans now own a smartphone while smartphone usage among those 65 years of age and older is only 42%. Although I am not aware of a study supporting my own observations, I see that older adults (seniors) are much less inclined to update their technological equipment. It is not unusual for me to sit down with an older friend or acquaintance to help them with genealogical research and find that I am confronting a computer that is almost 10 years old and an operating system that has never been updated. The resistance to updating technology definitely increases with age. In many cases, people have the attitude of using the "appliance" until it breaks. Depending on the amount of usage, some computers could conceivably continue to operate indefinitely. My experience, the mechanical parts of the computer fail much more quickly than the electronics. But I seldom keep a computer long enough for it to fail. I am always pushing the speed of the computer. When I buy a new computer that seems fast at first but over time my perception is that the computer slows down considerably. Eventually, I get so frustrated I buy a new computer. Most recently, that cycle runs between 3 to 5 years. Most people that I find that have very old computer equipment are usually completely satisfied. This is really a dilemma for the entire technological community that relies on people upgrading their equipment regularly. Car manufacturers have addressed this issue by producing new models every year and heavily advertising the features of the new models. Unfortunately, the features of new computers are rather esoteric and harder to understand. Computer manufacturers are not very good at explaining why you need to buy a new computer. As we approach the end of the year 2017, computer technology is poised to take another major technological advancement. Intel Corporation is announcing major chip upgrades with vast increases in speed. If you sit in front of the computer all day like I do this announcement means that I will be considering upgrading my equipment again. If you are the average genealogist, you're probably not even aware of the processing chip in your present computer. If you do find yourself looking at your old dusty computer and deciding to purchase a new one, you may come to the question of whether or not to replace your desktop computer with a laptop. I am seeing up-to-date laptop computers with adequate memory for genealogical purposes selling for around $400 brand-new. I have also seen complete desktop computer systems including a monitor for as low as around $600. For me, the deciding factor as to whether or not to have a desktop computer is the size of the screen. Technically, I could buy a laptop computer and plug it into a large monitor but to buy a comparable laptop and a large monitor and a separate keyboard and a separate trackpad or mouse has never made a lot of sense to me. I choose to have a separate laptop and a desktop computer. 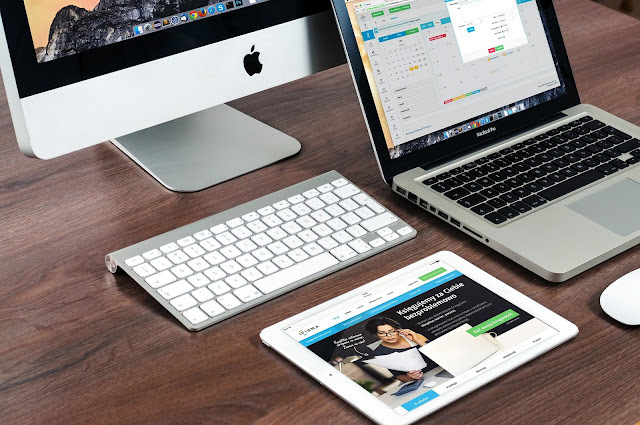 But for most genealogical purposes, if you can manage with a smaller screen, a laptop makes more sense than a desktop computer. One problem I do see with laptop computers is the fact that most of the users do not backup their entire hard drive. With a desktop computer, I can leave the computer plugged into several external hard drives and set up a constant backup program. With a laptop, it is likely that I will back up the internal hard drive less frequently if ever. We fully realize that there is not a whole lot I can say that will change the buying habits of older genealogists. When it comes right down to it, they are not likely to read my blogs or attend any classes or watch any online videos. But for those who do, I suggest a review of your computer equipment might be appropriate. 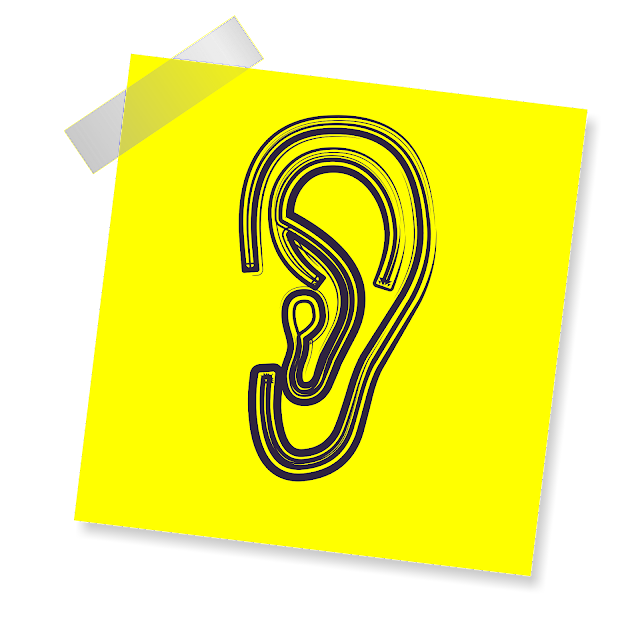 I have worn hearing aids off and on for years, usually more off than on. I recently got a pair that connects to a Bluetooth receiver and microphone. To my surprise, the Bluetooth microphone connects to my iMac computer and I can use the Dragon Dictate program to do voice recognition. Every once in a while, I write an update on the use of voice-recognition software for genealogical purposes. Because of this new development, I thought it was a good time to do an update. So, you are reading a post dictated by the use of hearing aids. Voice recognition software works very well if you are accustomed to dictating. In my early years as an attorney, I did a lot of dictation. That generally stopped when I got access to a computer. Because of the way I write, it is much easier to type in some cases rather than dictate. In addition, even with the updated voice recognition programs available, you have to constantly reread everything that you dictate because the accuracy is still not perfect. This is doubly true for me because I edit as I type. Voice recognition software is indispensable for people who have limited keyboarding ability or skills. People are becoming more accustomed to using voice recognition because of the smartphone apps such as Siri. But genealogical research involves a fairly large number of names and the voice recognition software does not do a good job of distinguishing between similarly sounding names. 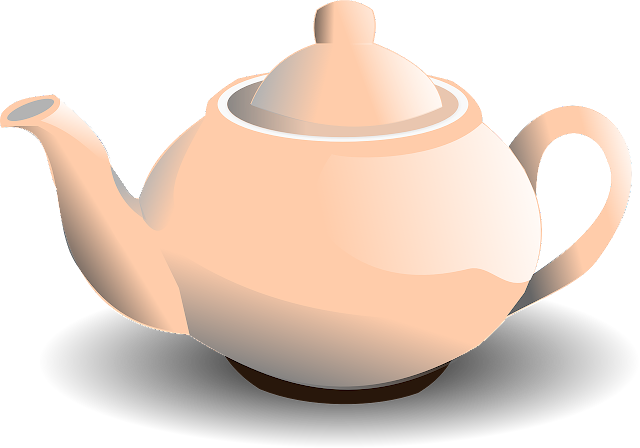 But for pure text writing tasks such as this post, the software is adequate. If you wish to experiment with voice recognition software, I suggest using the programs that are integrated into the Apple OSX and the Microsoft Windows operating systems. 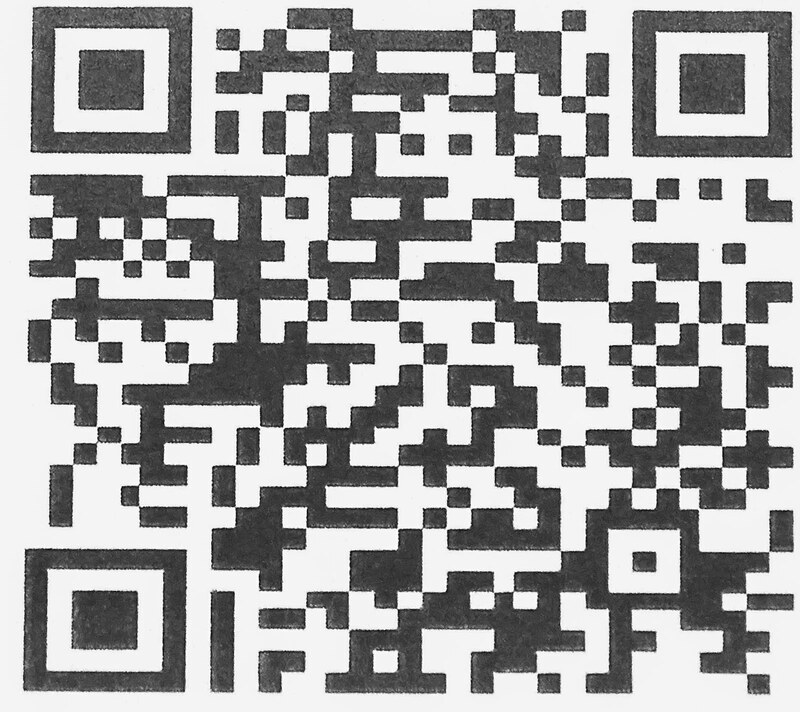 You can find instructions for using both systems online. 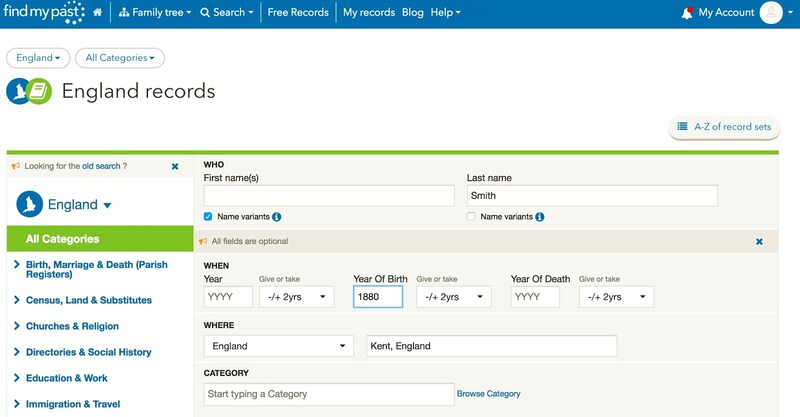 What are the "Restricted" Records on FamilySearch.org? Records that are only available for review at the Family History Library in Salt Lake City, Utah, i.e. when the researcher is physically present in the Library. Records that are only available for review when the researcher is in a Family History Center and using a computer connected to the Family History Center Portal. The very small category of records that are only available to researchers who have certain qualifications, i.e. members in good standing of The Church of Jesus Christ of Latter-day Saints. 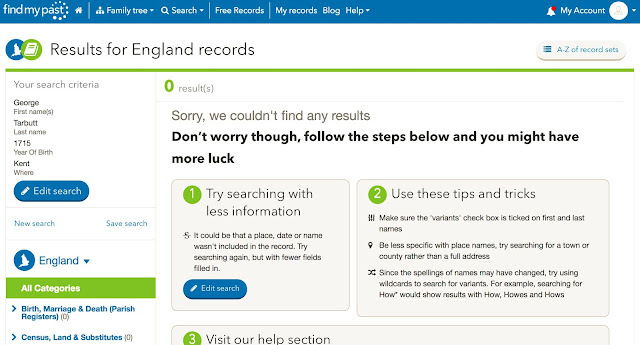 There may be additional reasons why certain records are not available online at all. It is entirely possible that the restrictions imposed by those who originally supplied the records can change over time. As a matter of fact, when FamilySearch and its predecessors began acquiring microfilm records back in 1938, many of the countries in the world today did not exist and many of the countries that existed back in 1938 do not exist today. I have heard complaints from a very small minority of the users of the FamilySearch.org website who complain that "all the records" are restricted. In fact, very few of the records are actually restricted even including those restricted to viewing within Family History Centers. 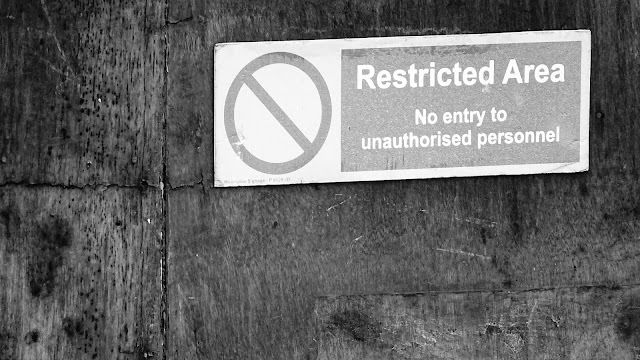 Over time, some of these restricted records may become more freely available. However, the opposite can also occur; the original suppliers of the records may choose to have them removed from circulation. This occurs entirely independently of any of the issues involving microfilm. If you take a moment to think about the situation, you will realize that the discontinuance of the shipment of microfilm has nothing to do with the restriction issue. Of the three types of restrictions listed above, each of the restrictions applies to microfilm and are only more evident now because of digitization. There have always been records that were restricted to viewing in the Family History Library in Salt Lake City, Utah. As for the microfilm, use of microfilm was always restricted to Family History Centers. The only thing that has changed is the fact that many more documents are now freely available online without restrictions than ever before. 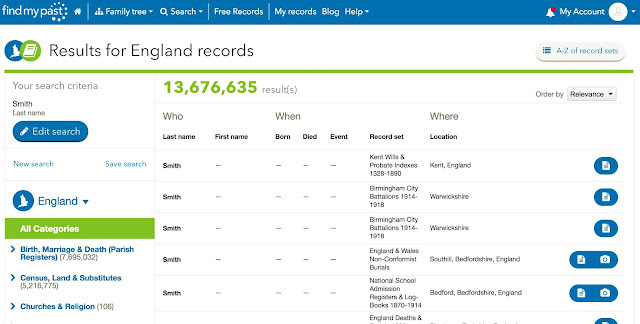 To repeat, records with restrictions are not the fault of FamilySearch. During the past couple of weeks, I have been doing an informal poll about the issue of FamilySearch discontinuing microfilm shipments to the Family History Centers around the world. I have asked easily over a hundred people who are attending my classes and therefore likely interested in genealogy. I wrote about the results of my inquiry in a post entitled, "The Impact of the Microfilm Issue" on my Rejoice, and be exceeding glad... blog. What I found was that very few of the people, only one or two, had even used microfilm in the last year. 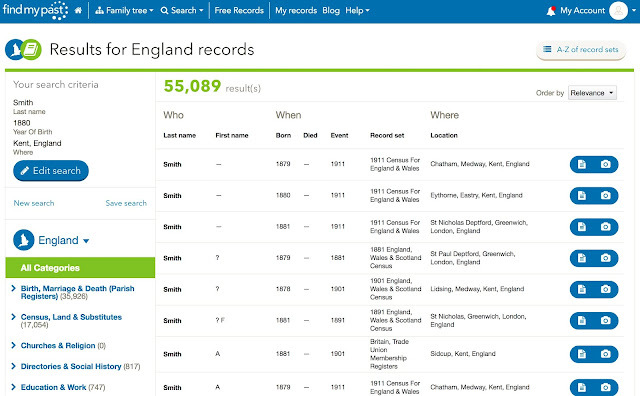 But I am finding some issues for the "serious" (for lack of a better term) genealogical researchers. The question is do these issues interfere with our present modus operandi? Well, yes they do. Those of us who are wedded to microfilm will have to transition to finding and looking at digital images. Perhaps we need to recall the time in the not-too-distant past when the only microfilm available was sitting in the Salt Lake City Family History Library (aka Genealogy Library). As time passed, we were able to "order" rolls of microfilm from the Family History Library and then after a number of years, FamilySearch.org began to host "digital" copies of those records. We have watched as that collection of online records grew from a novelty to billions of records. I think the first thing we need to consider, assuming I include myself in the category of "serious" genealogical researcher, is whether or not we are personally familiar with the existing online record collections on FamilySearch.org, Ancestry.com, MyHeritage.com, and Findmypast.com? Of course, these four websites hardly exhaust or even begin to exhaust the number of digital images available for research online. What I am finding for myself and after talking to other "serious" researchers is that more and more of the records we need for in-depth research are being digitized and are available online. Are there still going to be records that are only available on microfilm? The answer is a qualified yes. Given the case of microfilm digitation which I understand to be for FamilySearch rapidly proceeding, I would suggest that it is important to check almost daily for additional new records and certainly to check before becoming disturbed about microfilm shipments. 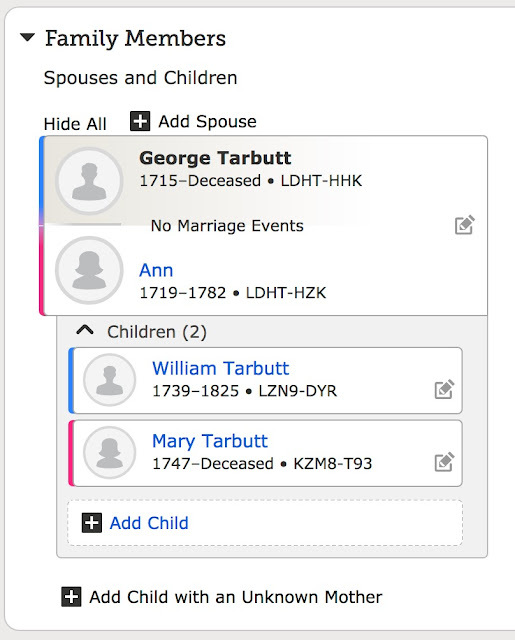 I'm also certain, that FamilySearch will implement some procedures that will allow those who need a microfilm digitized, particularly from the Granite Vault, will have a way to request that the digitization be expedited. Meanwhile, keep ordering microfilm through 31 August 2017 and keep watching the progress of the digitization of the records. I was overhearing a discussion the other day about slide rules. I still have mine on a shelf where I can get to it easily. 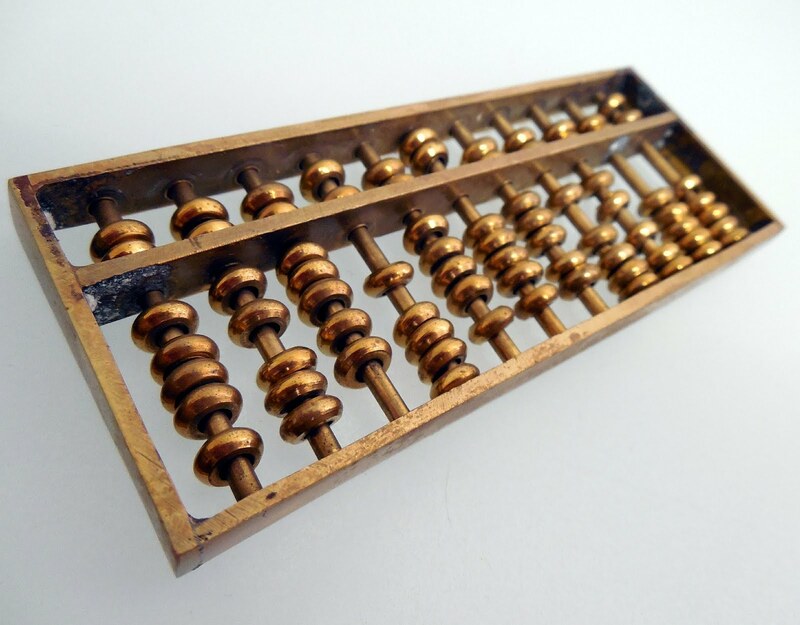 I also have an abacus. There is something comforting and physical about these devices that is lacking in computers. But the reality of the day is that I am fully integrated into the computer world. From time to time, I have written about the digital divide between computer literacy and computer illiteracy. Genealogical research and all the activities associated with it can be done on paper, just as day-to-day calculations could be done on a mechanical adding machine, slide rule or abacus. 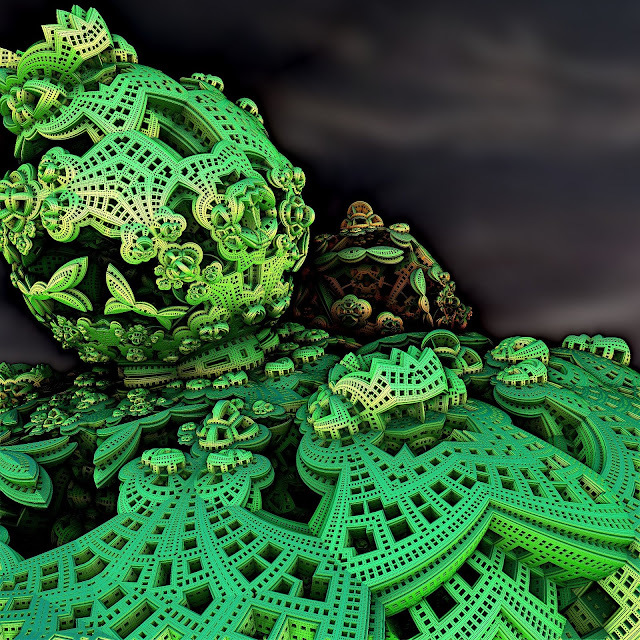 The advantage of doing those calculations on a computer seem overwhelming obvious, but we have yet to begin realizing the potential of the computer over older systems. I have titled this post "Computer Aided Genealogical Research" or CAGR. It turns out that there are several genealogy societies with similar names, but otherwise the name and the acronym are both made-up. What I see is that, so far, the computer is acting primarily as a substitute for paper and the devices listed above. It is also becoming a primary communication device. But as far as genealogical research, it is still a paper substitute. Of course, there are a few glimmerings of progress towards CAGR with a variety of record hints from large online genealogical database companies, but otherwise, we are still doing research in the same way with the same objectives as did our predecessors. Let me start explaining this concept with a hypothetical situation. Let's suppose that I am doing research on my English ancestors. Let's further suppose that I use a desktop based computer program to store my genealogical data. Going back a few years, I do all my research in libraries and archives and record what I find in my desktop computer program. Hmm. Let's suppose I move forward a few years and now I have this wonderful internet connection. I can now spend fewer hours in libraries and archives, but I am still storing all my information on my desktop computer. Time passes, as hypothetically, I become connected with an online family tree program. Despite the changes in venue, I am still doing what I have always done, I have just moved some of my data from my local, desktop program to an online program. Eventually, because of the development of the internet and the establishment of the huge online database programs, I move more and more of my activities to the internet. But because of fear of losing my data and other considerations, I still have desktop genealogy program. Because of the development of research hints, where the online genealogy companies suggest connections between my ancestors and the documents and records in their databases, I see the need to put my family tree information on several such programs (i.e. websites). What is missing? What have I gained? First of all, the computer is still acting as automated paper. I am still doing all of the research, the analysis, the data entry, the recording of sources etc. I see that some of these activities are now aided by the computer systems but only those that were formerly done on paper. Searching for documents has become easier, I make even fewer trips to archives and libraries, but the essence of genealogical research has not changed. Again, what is missing? The answer is integration. I have data scattered across the internet. I have my family tree in several different online and even several desktop programs. These online programs are very much like warring nations. I can talk to each one of them, but they do not talk to each other. In this case, the computer and its connection to the internet actually interfere with my research. Remember, we are in the middle of a hypothetical situation. Let's suppose I search for information about my hypothetical English ancestors. Let's suppose that the information I am seeking does exist but I do not know where it is located. I am forced to search each separate repository where that information may be located. If the information is sitting in one website, search a hundred others is waste of time, but there is no mechanism to tell me which of the repositories has the information. The internet has essentially become an almost infinite shell game. Despite Google searches, the information I need is really locked up tight in some database on some computer and I have to guess where it is. Presently, I have many separate programs all telling me that they have data for me when what I need is not really there at all. CAGR should help me find my ancestors' data but it does not yet exist. There is a measure of discussion about "smart assistants" and robo products. We have offensively stupid programs such as SIRI and other such programs that do things like look at the clock or tell me where to buy pizza, but sophistication at the level of active assistance in doing research is almost entirely missing. I am not here to decry the advances that have been made. I am merely pointing out that we have a long way to go before a computer attached to the internet can do what I do when I am doing research. Perhaps we should start talking about how such a system might work. Perhaps we need to find a way to allow universal access and data exchange of genealogical information between all the presently closed systems. Perhaps I will not live long enough to ever see such systems.